Its not often that I would describe a place as both serene and exciting, but that is exactly the case for the Villa del Palmar at the Islands of Loreto, Mexico. 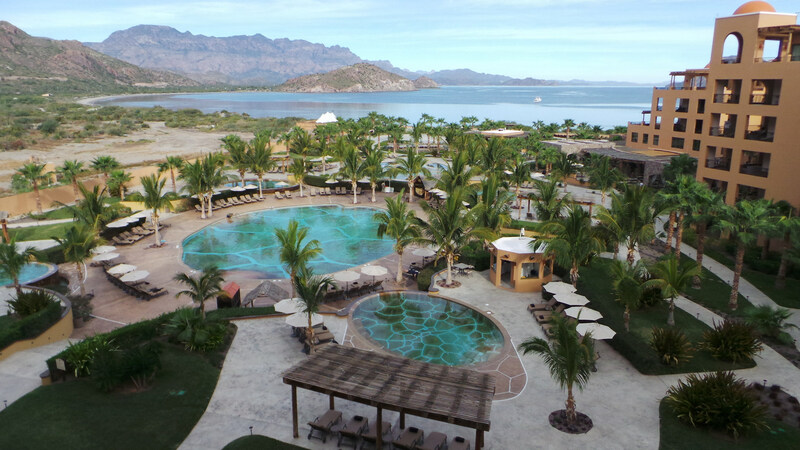 Located on the Baja Peninsula, the Villa del Palmar has a lot to offer vacationers. Breathtaking views of the mountains and the ocean will calm your spirit, while close encounters with whales and other wildlife will get your heart racing. I recently had the chance to learn this first hand! When I arrived in Mexico, I was ready for some relaxation. It had been a busy couple of months in my household and although it was a working trip, I knew the sunshine was just the medicine I needed. The resort was promising, with intricate tiling on the floors, gorgeous stone steps leading to the turtle shaped pool, and of course this incredible view. Resting on it’s own bay, the Villa del Palmar looks out at the ocean and is surrounded by mountains. Pelicans dive into the water near the beach while guests snorkel and dig for clams. It’s true paradise! We were spoiled inside as well. My King bedroom suite featured a living and dining area, a full kitchen, 2 baths, a jacuzi tub and a huge balcony with an unforgettable view. Villa del Palmar prides itself on being true to the Mexican culture. They demonstrated this right from our arrival by performing a cleansing ceremony with each guest where we were helped to wash away our stress and prepare to enjoy our stay. We were also served beverages and offered neck and shoulder massages by Registered Massage Therapists. It was one of the warmest welcomes I have ever received at a hotel or resort, and they perform the same ceremony for every new guest. 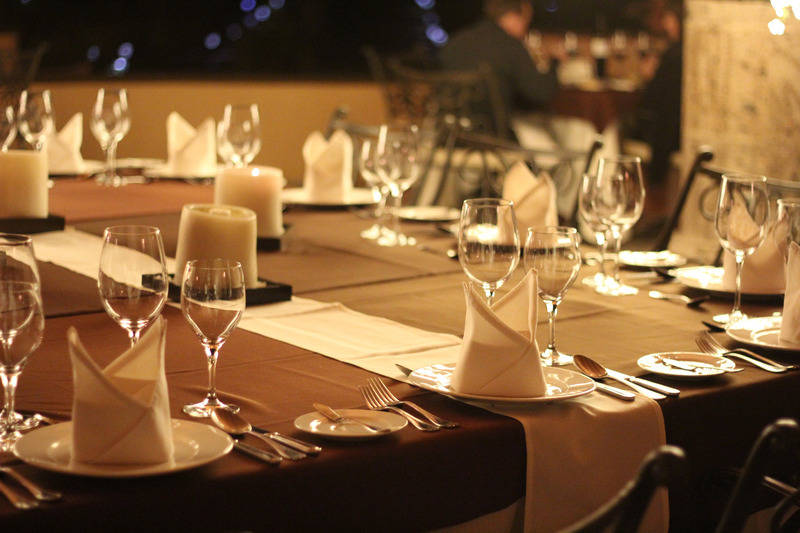 It is the people at Villa del Palmar that truly make it a place to remember. The staff get to know their guests and do their best to provide special care to everyone. Their exemplary service was showcased in many little ways, like remembering our names and room numbers, and greeting us with handshakes each day, but they also went above and beyond. Over lunch early in the week, we overheard that there was a location about an hour away that guaranteed sightings of gray whales, and we immediately wanted to go! A tour was arranged for us and some other hotel guests to go later in the week, and we were not disappointed. 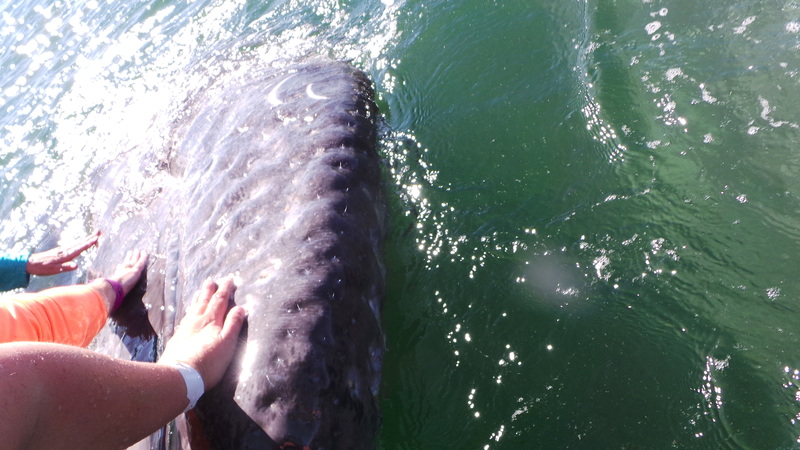 That is my hand on a gray whale. Seriously. We saw whales on two other boating excursions, one of which was intended to be a wine and cheese cruise. Once we spotted a blue whale, the captain was happy to take us whale watching instead. Of course we enjoyed some wine and cheese while we did it! Their flexibility in programming was very much appreciated because every vacation should be treated like a once in a lifetime experience, and we didn’t want to miss out on any of it. While visiting the Sabila Spa, which is located within the Villa del Palmar, I was experiencing some back pain. Claudine (a lovely Canadian expat RMT) was quick to give me some relief and some recommendations for managing my back pain at home. I had already experienced the baths and the massages at the spa, but Claudine’s kindness was definitely a highlight. Another highlight was the food. 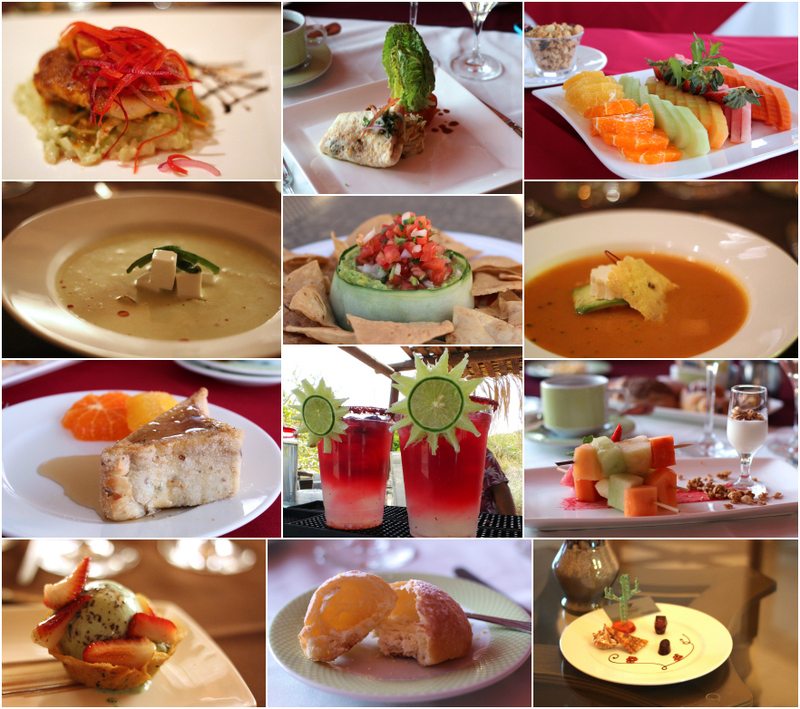 As an all-inclusive guest I could visit the buffet in the Market Restaurant, order off the menu at Casa Mia or enjoy some fine dining at Danzante. Everything is created fresh and so delicious. Even the table settings were divine. All of our meals were authentic Mexican dishes that you would find all over the country, fitting with the authenticity of the entire place. 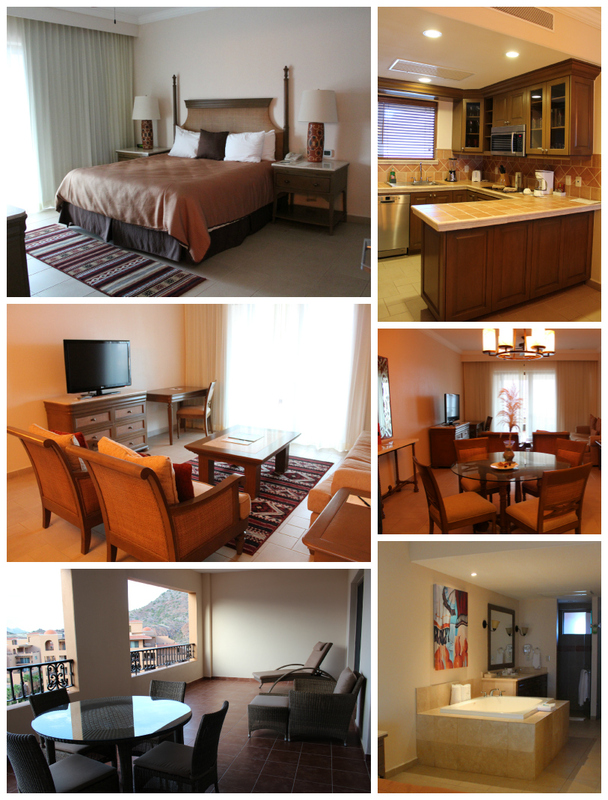 You don’t feel like you are at a tourist hot spot while at the Villa del Palmar, even if it has a 5-star rating. To me it felt like I was a guest in an extremely luxurious and welcoming Mexican home.